The US’ Pivot to Asia (P2A) is obviously aimed against China, and Washington’s ultimate plan has always been to assemble a coalition of countries that can contain the global supergiant. As the Pivot enters into its fourth year soon, the contours of the Chinese Containment Coalition (CCC) are beginning to take shape, and it’s become evident that it’s going to be centered on the Philippines. The island chain’s geopolitical connectivity potential can easily be harnessed to link together the CCC’s various players, and it’s also subservient enough to the US to the degree that it has ignored the exceptionally dangerous consequences of potentially hosting multilateral forward operating bases against China. As apocalyptic as the US’ end game scenario may be for regional multipolarity, it’s not at all assured to succeed, as there are quite a few contingencies that could develop between all of its assorted partners in preventing them from linking up in the Philippines and actualizing the Asian NATO. The article is thus divided into two parts; the first one describes the forecasted composition of the Asian NATO and explains the bilateral relationships that make it possible, while the second one investigates the multitude of factors that could impede its formation and/or lead to its eventual unravelling. Prior to commencing the study, one must first understand exactly what is meant by the “Asian NATO”. The author explored the genesis of this concept in his earlier work on how The US Is Juggling Chaos And Coordination To Contain China, and it boils down to formalizing the CCC in order to simultaneously split ASEAN between anti-Chinese states (like the Philippines) and those that behave pragmatically towards it (like Cambodia), and create a formalized mechanism for the US to coordinate further anti-Chinese moves in the region. The Philippines are the logical staging ground for this endeavor owing to its de-facto mutual defense guarantee with the US and the overlapping strategic partnerships that it has with Japan and soon Vietnam (which are its first and second respectively, not counting the ‘special relationship’ with its former American colonizer). The overall idea is for the island chain to act as a geographic facilitator in linking together both of its strategic partners under American guidance in order to enhance their combined ability to coordinate anti-Chinese actions in the East and South China island disputes. Additionally, because of the Philippines own spat with China, it could also be used as a ‘sacrificial lamb’ in provoking a small-scale military engagement with China (one in which the US would purposely refrain from participating in) in order to test the People’s Liberation Army-Navy’s responses and assist with the crafting of more effective anti-Chinese tactical maneuvers by the Asian NATO. Or, in a variation of this scenario, it could become the Asian application of the Reverse Brzezinski policy of luring China into a strategic military trap by using its small and provocative neighboring maritime state as bait. 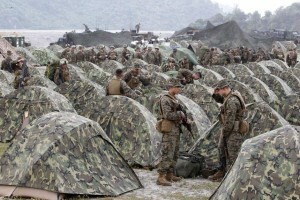 Unlike Ukraine, which has no formalized mutual defense relationship with the US, the Philippines could call upon the Enhanced Defense Cooperation Agreement in order to turn even the tiniest exchange of fire into a global hot spot of brinksmanship between the US and China, thus giving it a freakishly disproportionate weight in international affairs. 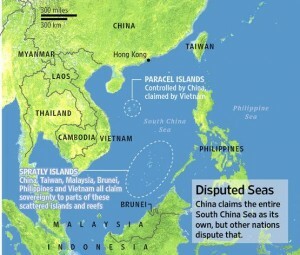 The function of a Japan-Philippines-Vietnam axis is to create a ‘backwards L’ of military containment in order to ‘box’ China inside mainland Asia, with the Philippines being the fulcrum of this entity. Japan is the most active Lead From Behind proponent of this policy, taking the initiative (under American instruction) to authorize both the sales of weapons and the deployment of troops abroad. Considering the strategic partnership between them and how each has their own island disputes with China, it’s logical to conclude that Japan will seek to make the Philippines the central focus of both anti-Chinese policy manifestations. The Diplomat reported at the end of June that this certainly seems to be in the cards, with Tokyo preparing to sell Manilla a slew of naval and air units in exchange for a “Visiting Forces Agreement (VFA)” that could allow it to deploy its first foreign forces since World War II. One should also be reminded that both sides held their second-ever naval drills this summer together with the US, showing that there’s actual substance to their strategic partnership and that it’s not just rhetorically based. The other end of the ‘backwards L’, Vietnam, is also increasing its interactions with the Philippines, as the slated strategic partnership attests. Last May, military units from the two sides symbolically enjoyed a game of football together on one of the South China Sea’s disputed islands (the second time they have done so), showing that each of them is serious about working together to confront China in this region. The aforecited article also details some of the bilateral military cooperation between both sides, with each country’s navy calling port at the other and even holding informal discussions on setting up joint patrols in the area. It’s highly predicted that the signing of a strategic partnership between them will lead to an acceleration of military cooperation, and furthermore, will even put Vietnam and Japan’s militaries into direct contact with the other via the Philippines’ geographic intermediary function, which also accomplishes a contingent goal of the US’ P2A by having both CCC anchors enhance their full spectrum bilateral relations (especially in the military field). In essence, there are actually two CCC axes that the US is building and wants to unite, and these are the ones between Vietnam-The Philippines (already discussed) and Japan-South Korea. To say a few words about the latter, it’s still not entirely certain that Seoul will commit to joining the CCC. For example, even though it’s part of a trilateral information sharing mechanism between it, Japan, and the US ostensibly against North Korea (which could realistically be turned against China in the future), it’s also being wooed by China through the recently inked Free Trade Agreement and has been ambivalent about hosting the US’ THAAD “missile defense” units (potentially even going it alone to produce its own domestic version instead). Still, this hasn’t halted the country’s interest in cooperating with the Philippines, the magnetic center of geopolitical attraction to all members of the CCC community. The country’s Defense Minister visited the island nation earlier this month to discuss future military collaboration (as of now, just weapons sales and technical assistance), but such a big step could also help further last year’s proposal for the two countries to enter into a strategic partnership with one another. While South Korea doesn’t have any island disputes with China and behaves moderately friendly towards it in a military sense (not counting the anti-Chinese agenda of the thousands of US troops that are based there), if it got caught up in the CCC’s intrigue inside the Philippines, bilateral relations could certainly suffer as a result of the heightened and warranted suspicions that China would inevitably have towards its maritime neighbor. With or without South Korea’s incorporation (which is still questionable), however, the central axis of Japan-Philippines-Vietnam still represents a formidable threat to China, but the auxiliary participation of the peninsular state would definitely contribute to its enhanced effectiveness, and it’s worthy to monitor any forthcoming decisions that its leadership takes in this regard. On the topic of auxiliary members in the CCC, one must inevitably consider India’s inclusion and the anticipated role that Australia will also play. Looking at the first, New Delhi under Prime Minister Modi has been increasingly assertive of its foreign interests, and this includes the evolution of its “Look East” policy to one of “Act East”. One of the highlights of the US’ new National Security Strategy is to assist India in the application of this new policy, with the understood overtone that it’ll be directed against China in Southeast Asia and the South China Sea. As India finally grows out of its South Asian neighborhood and begins exploring its role in the global context, it’s entirely possible that it could take on the role of anti-Chinese vanguard if certain American-hoped-for conditions are met, specifically the intensification of Indian-Filipino military relations that seem to be directed against China. If the Philippines go as far as establishing a strategic partnership with India that draws the country into contact with the nascent Asian NATO that’s forming there, then it would confirm Beijing’s suspicions that India does in fact intend to challenge it in the region, likely on the US’ Lead From Behind behalf. The second auxiliary anchor, Australia, has an entirely self-interested reason to get involved, and this is to counter its regional Indonesian rival and open up a second front of pressure that could possibly be applied against it in the future. The two countries have been competing with one another for some time, and Australia bases all of its regional policies around the issue of how they relate to this rivalry. Thus, the twin military exercises that it plans to hold with the Philippines this year (built on the basis of a 1995 defense cooperation memorandum) aren’t so much directed against China as they are against Indonesia, at least in Australia’s strategic calculations. The island-continent just signed a free trade agreement with China earlier this summer, so it would be entirely schizophrenic for it to totally turn against its largest economic partner at this moment. Rather, it’s paying superficial homage to the US’ CCC in order to please its ‘big brother’ while simultaneously maneuvering itself into a more beneficial position vis-à-vis Indonesia, which incidentally, also satisfies another American goal pertaining to the P2A. To explain, the US wants to ensure that Indonesia does not become too pragmatically friendly in its relations with China, preferring instead for the country to remain the ‘Asian Yugoslavia’ as long as possible in the context of this New Cold War. To prevent Indonesia from acting out of line with American grand strategic interests, the US is using Australia to ‘box’ the country in, following the ‘backwards L’ template that it’s directed against China. Australian-Filipino military cooperation is the northern point of this construction, with the fulcrum being Australia’s political influence over former colony and LNG-rich Papua New Guinea and the de-facto protectorate that it’ll likely form over Bougainville Island after the mineral-rich province predictably votes for independence sometime before the referendum scheduled by 2020. Pertaining to Papua New Guinea’s LNG potential, between Total and Exxon’s investments, it has the capability of producing 13 million tons of LNG per year, or about 1/6 the output of Qatar, and about Bougainville, if it restarts operation of the world’s largest copper mine in Panguna and returns operating rights to Australian mining giant Rio Tinto, then Canberra would inevitably gain a strategic foothold over its government. Concurrent to its influence on the eastern part of the New Guinea island and its surroundings, Australia could also become a de-facto state sponsor of the West Papua independence movement (“Indonesia’s Katanga” in terms of its mineral wealth), which while having strong arguments in its favor and a lengthy list of documented and legitimate grievances, could see its cause hijacked by abroad for geopolitical ends and marketed as an “Asian Darfur”. 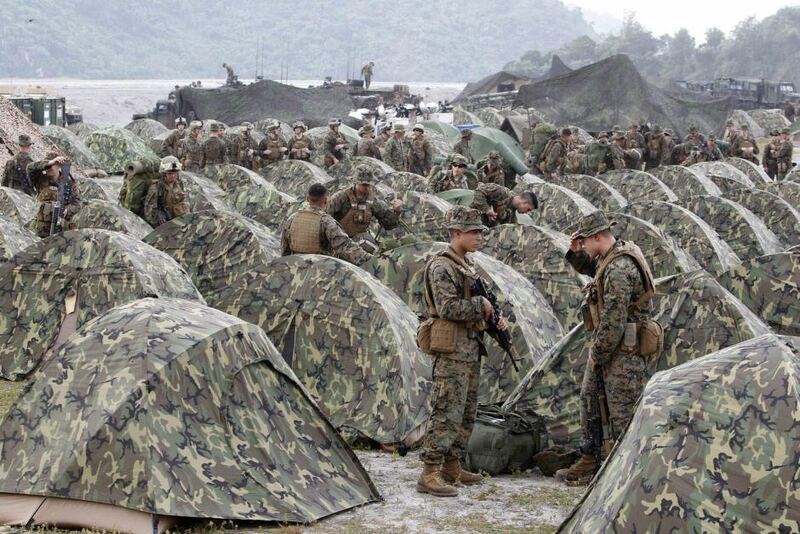 Rounding out the ‘backwards L’ of Indonesian containment, over 1,000 US Marines are now routinely rotated out of the North Australian city of Darwin, thus adding a third lever of external pressure against the archipelago’s authorities. If one adds in the US’ regime change attempt in Malaysia (meticulously exposed by Tony Cartalucci), then an actual containment square emerges, whereby the country is faced with potentially hostile elements in its northwest (a Color Revolution government in Malaysia), northeast (the CCC/Asian NATO that could also turn against Indonesia), southeast (foreign influence over the Papuas), and southwest (American Marines in Darwin, Australian control over Christmas and Cocos Islands and American military interest there). Therefore, it’s becoming apparent that the containment of Indonesia is inseparable from the containment of China, as the former is entering into effect via moves euphemistically made in advancement of the latter, and this underreported element of the P2A certainly deserves further analytical attention from other researchers.